Sri Ram Ashram | Where Is Annie? I always thought an ashram would be full of austere gurus meditating for hours with their students then moving into yoga poses for the next several hours all while fasting on thinned cow’s milk. The word ashram, however, means home or hermitage in English and applies to many different kinds of institutions in India. 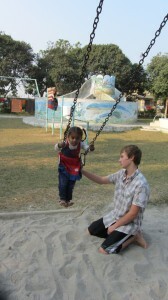 Sri Ram Ashram is an orphanage, a home for orphan children with a family of over 60 brothers and sisters. For the month of November, it was our home as well, and we were welcomed as part of the family. It was comfortable at the ashram. 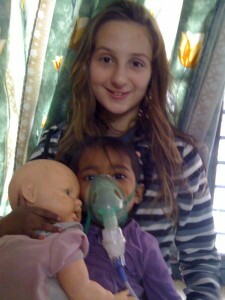 The orphanage is run by an American foundation, and the kids are well taken care of. There were girls and boys dorms. There was a large kitchen and dining room. The kids played in the huge yard with swingsets, slides, and a trampoline (with adult supervision). A new climbing rope was put up during our visit. For the guests there was separate housing across the courtyard from the kids’ dorms. Our family had two rooms, each with two twin beds and a bathroom with hot water. There were ceiling fans for the hot days and thick blankets for the cool nights. Mosquito repellent was plugged into the wall to keep the buggers off while we slept. High speed wireless enabled Bill to spend the month working and my kids schooling. The ashram kids’ days were were dictated by a gong. The first bell was about 5:30 when the chai was ready and the kids got up. Next bell was for breakfast at 7-7:30. Lunch at 11:45. Tea/snack at 3:00. Prayer service at 6pm and dinner at 6:30-7. So many gongs throughout the day kept the kids on schedule. Only on Sundays did things run late and the kids got to sleep in…by half an hour. Although we didn’t get up with the 5:30 am gong, our family paid attention to it. After all, it told us when the food was ready. We were fed three meals a day, and the food was very good: rice, a dal, a vegetable, chapatis, and a pickle (the spicy, Indian kind). The dishes changed everyday so there was a great variety of tastes. The milk was fresh from the ashram’s cows and always served boiling hot or in the chai. Creamy yogurt was made from the extra milk. In the morning there was hot, sweet (and I mean sweet) chai before breakfast. In the afternoon sweetened and unsweetened chai was served. On Sunday mornings a special bread was made by some of the older kids, sometimes aloo paratha, sometimes puris. Very importantly the food and water were safe. This kept the kids at the ashram as well as us healthy. We took it for granted and had to learn through experience that it’s not true throughout much of India. There was a dining room for the guests when we preferred not to eat with the ashram kids. In the kitchen the boys and girls sat separately from each other. The kids ate sitting cross-legged on the floor (true Indian style). They were supposed to eat in silence. I tried to sit cross-legged on the floor with the kids and tried to be silent for a couple of meals. I wasn’t so successful. I was much more successful making friends with the visitors while sitting around the dining table in our dorm. The visitors came from Germany, Australia, Toronto, New York, and, yes Santa Cruz. We shared a lot of stories and, quite frequently, ketchup. Bill called it “tomato chutney”. With all the food, we needed exercise. Now, again, this was not a yoga ashram. Very few of the kids were practicing asanas. Instead the kids are into Crossfit. As I interpret it, Crossfit is a macho workout routine with intense calisthenics while lifting maximum weights. About as un-yoga as you can get, and Hank has fallen in love with it. It’s the first exercise regimen he’s actually gotten a high off of. So we, in India only miles from where the Beatles studied with the Mahareshi, were doing clean jerks, not down dogs. We meaning Hank and I and Sunita. 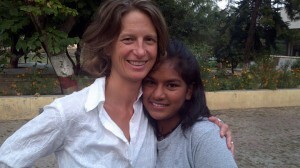 Sunita was employed as a “mummy” for the children. She fed, bathed, and clothed the babies and toddlers. She slept with them in their bed. She was there when they fell down, or needed their noses wiped, or their bottoms washed. Except when it was time to do Crossfit. Then she nagged Hank and me to get outside and workout. She looked the part of a mummy, not of an athelete. But she was committed, and she was fun. Her English was limited to “push-up”, “squat”, “wall ball”, and other crazy Crossfit terms. But we laughed about these exercises and our poor ability to accomplish them with grace. We needed no interpreter. We bonded over pain. 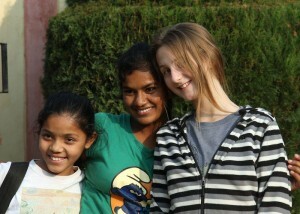 With over 60 kids at the ashram there’s a lot of potential for friends. 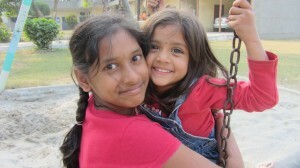 My kids got the chance to eat, pray, and play with the ashram kids. They took tabla lessons on the weekends during music class. They shared a slide show of their travels with the kids. They pushed the little ones on the swings, rode the scooters with the school aged ones, and arm wrestled the bigger ones. On a campus where the kids are into Crossfit, my kids did not win at arm wrestling. 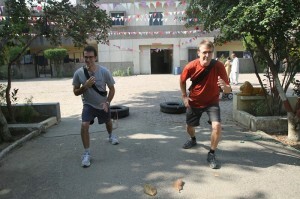 They were good sports, however, and continued to accept the challenge. Both Hank and Cat spent a lot of time with the toddlers when the older kids were at school. There was a constant refrain of, “Hank-bhai (brother), POOOSH!” as the two year olds sat on the swings in a line waiting to fly. For me it was a delight to just be with kids. They all avoided me when it came time for their immunizations, but when I wasn’t being quite so mean I got to be their auntie. (Actually, everyone called me “Annie-didi” which means older sister. Bill, on the other hand, was called “Bill-uncle”. I guess it was the gray beard. Poor guy.) I loved my time with Sita, one of the cutest two year olds in the world. Every morning I would pick her up to take her to the clinic to give her medicine. She would wrap her arms around my neck. I would melt. I’ll never forget walking across the courtyard with a two year old on either side of me, each holding one of my fingers finger. I was in heaven. 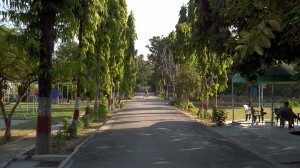 Sri Ram Ashram had become a new home for me. Now I’m kind of homesick.